copyranter: Introducing F*CK ME Camels. Viva Viagra! Long Live My Erection! copyranter's pick for 2007 ad Emmy. Oh you EVIL EVIL EVIL EVIL EVIL tobacco companies! I thought women want men to get off them, not on. I don't see it as a problem at all. Wait, till FDA starts regulating cigarettes - we will have lite / organic/ health / low-fat and a lot more. Fun. 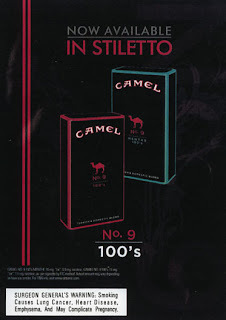 “Women need nine” was there for the taking and Camel passed? I’m here all week people.